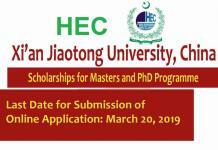 Applications are invited from the Higher Education Commission (HEC) of Pakistan to Apply for the HEC Youth Excellence YES China Scholarship 2019. 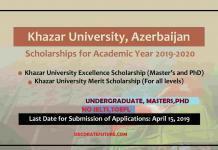 The YES China Scholarship is for pursuing Master Degree Program from China For the Students Coming From Pakistan with all the Financial support will be Given for the academic year 2019/2020. 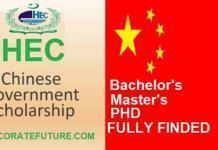 Youth Excellence YES China Scholarship is HEC scholarships for MS 2019 in China. 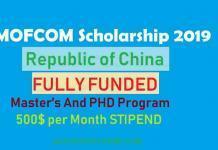 To promote the mutual understanding and friendship between China and other countries, and to provide Chinese scholarships educational opportunities to the youths in developing countries, the Chinese Government established the “Scholarship for Youth of Excellence Scheme of China- Master Program (YES CHINA)”.China scholarship for Pakistani students. Age should Not be More than 45 Years. Eight (08) Master’s degree programs are open to applicants from 66 developing countries. You can Check the List of Course below. Multiple Fields are given below in Different Universities of China. 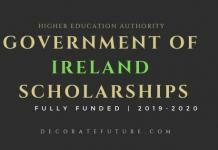 Eight Universities & Eight Courses free scholarship to study in China Further details are given below. HEC Youth Excellence YES China Scholarship is a Fully funded scholarship for Pakistani students in China will all expenses covered. Exempted fees: tuition and internship fees. One-off settlement subsidy after registration. One-way air ticket to China upon registration and a one-way air ticket back from China to the student’s home country after completion of the study. Healthy both physically and mentally; not over 45 years old (born after September 1, 1974). 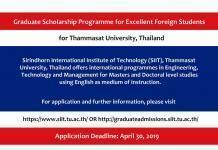 A bachelor or higher degree, at least 3 years’ work experience, some educational or professional experience in a field relative to that of the program applied. The Detailed procedure & the Required Documents list is given below in the Red Color. Submit the online HEC application form available at HEC portal at https://eportal.hec.gov.pk/hec-portal-web/auth/login.jsf website and retain its printed copy. Submit Fees of Rs.300/-in favor of HEC through HBL online facility. A separate bank Account No. 17427900133401 at HBL, H-9 Branch Islamabad is being maintained for online transfer of fee to HEC from any HBL branch across the country. Application form (mentioned above) with a 2-inch photo and the applicant’s signature. Copies of bachelor’s degree transcripts. Two recommendation letters from the applicant’s employers and/or professors. Telephone numbers and email addresses of the referees must be included in the letters.